"Buildings - Commercial - General Stores"
This portion of the interview pertains to Harry Royle's memories of returning from the war and setting up his general store at Capitol Hill. Recording is of an interview with Harry Royle by Ross S. McLeod (and Bettina Bradbury) June 20, 1975. Major themes discussed are: the Depression and the running of a grocery store. To view "Narrow By" terms for each track expand this description and see "Notes". Harry Royle was born in Gibraltar in 1898 to a Spanish mother and an English father (all of the Royle children except for one were born in Gibraltar). Harry's father served in the army for twenty-one years and because of that, the family moved regularly. While Harry was still a young baby, the Royle family moved to Ireland for six years, where he began his first years of schooling at the age of four. His dad retired from the army in 1907 and was sent to Canada with the BC Electric Company (the London General Army Buses Company). The rest of his family followed two years afterward in 1909 and settled in South Vancouver. Harry and his three brothers joined the army and were sent overseas as part of the second division. Luckily, they all returned home to Vancouver in 1919. Harry worked at the Hudson's Bay Company "counter jumping" before opening his own store in 1924 at 5527 Hastings Street and Ellesmere Avenue, a confectionery and general hangout for neighbourhood children. "Harry's" was only twenty-five foot square and carried groceries obtained mainly from Kelly Douglas wholesalers. Most of Harry's customers worked at the mill at Barnet. Those that worked for the Canadian Pacific Railway were the few that still held jobs during the Depression. The store continued to serve the people of Capitol Hill throughout the Depression and war years, until Harry closed shop in 1945. Bettina Bradbury teaches history and women's studies at York University. She is the author of Wife to Widow. Lives, Laws and Politics in Nineteenth-century Montreal. (Vancouver: University of British Columbia Press, June 2011), 520p; Working Families. Age, Gender and Daily Survival in Industrializing Montreal. (Toronto: Canadian Social History Series, McClelland and Stewart, 1993); (Republished Toronto: Oxford University Press, 1996) (3rd edition, Toronto: University of Toronto Press, 2007). These interviews were undertaken after she completed her MA at Simon Fraser University in 1975 with the support of an LIP grant. 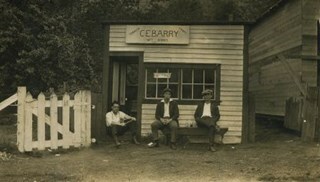 Photograph of three men sitting outside a small building that bears the sign "Cebarry - Tobacco, Candy, Soft drinks." One of the men is sitting in the doorway of the store while the other two are on a bench in front with three beverage bottles sitting between them. Another building can be seen to the right and a white fence is on the left. A caption accompanying the photograph reads: "Eddie's Store" and the men are identified as follows (l to r): E.R., AFP [Arthur Peers], and R.L.M. This photograph appears to have been taken by Arthur Peers, who travelled through the Fraser River Valley and worked on the construction of the Trans-Provincial Highway during the later 1920s. Photograph of the display of the General Store at the Burnaby Village Museum. An interpreter is standing in the store's interior. 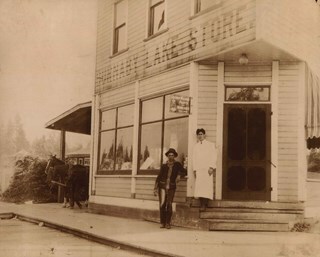 Photograph of two unidentified men standing outside the Burnaby Lake Store on Douglas Road and Sperling Avenue (old street naming system, this portion of Douglas Road is now Canada Way). Photograph of six men standing outside a building. 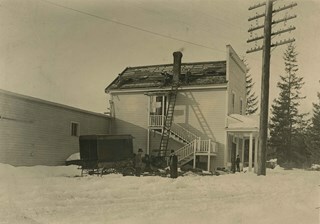 An accompanying note prepared by Burnaby Village Museum reads: "The photograph shows the exterior view of Leaf's General Store, situated on the northwest corner of 6th St. and 12th Ave. from 1904 to 1913 when it was burned out. George Leaf, the owner, was well known for his interest in sports, particularly lacrosse. He also owned another general supply store near McKay Ave. in Burnaby and it was known as the 'Keefer Branch.' For an unknown reason, Mr. Leaf earned the nickname of 'Mr. Burnaby'." Pictured in the photograph are (left to right) Andy Johnston, Bill Bailey, Harry Archerbald, Ed Harris, Bob Burgess, and Tom Breen. The description also notes that the dollhouse in the window of the store is made out of Sunlight Soap boxes. Photograph of the George Leaf general store, at 7745 6th Street. Identified are: (left to right) Andy Johnston, Bill Bailey, Harry Archibald, Ed Harris, Bob Burgess (George Leaf's half-brother), and Tom Breen. All were staff members of the store, which was one of the earliest businesses in Burnaby. In the reflection of the store window at the right is the streetcar station on the opposite side of the street. This store burned down in 1913, and a second one was built on Keefer Road (now McKay Avenue). Photograph of the inside of the George Leaf General Store and post office at 12th Avenue and 6th Street, 7745 6th Street. 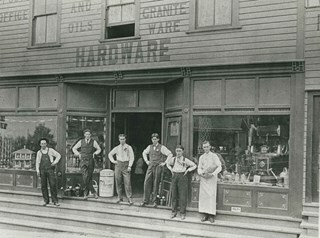 This was one of the earliest businesses in Burnaby. This store burned down in 1913, and a second one was built on Keefer Road (now McKay Avenue). Photograph of the inside of the George Leaf General Store and post office at 12th Avenue and 6th Street, 7745 6th Street. This was one of the earliest businesses in Burnaby. This store burned down in 1913, and a second one was built on Keefer Road . Photograph of the exterior side view of A. MacKenzie & Co / Jubilee Store. There are two men in suits standing beside a wagon, one with his hands on his hips, surveying a pile of bundles of wood that look like they have just fallen from the wagoon into the snow. A child stands at the front door of the shop, also looking at the bundles. The store was owned by Alexander MacKenzie, (1870-1949) who arrived in Vancouver in 1907. This store later became the Matheson and Sons Market. Photograph of the interior of Leaf's General Store. 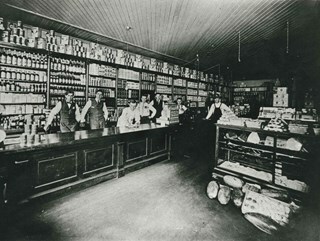 There are six men standing behind the counters, looking towards the photographer. There is a large cash register on the counter. Behind the counter are shelves stocked with bottles and cans. There is a counter with what appears to be baked goods in the centre of the photograph. There is a bunch of bananas hanging from the ceiling, and a column of cans that go almost as high as the ceiling in the centre. This photograph is reproduced in Michael Sone's book, "Pioneer Tales of Burnaby," pg. 21. 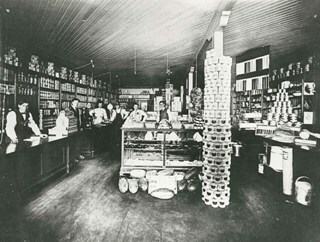 Photograph of the interior of an unidentified general store. The shelves are fully stocked with products that vary from stoves, lanterns, ladles, to scissors, etc. There are four unidentified men standing. One of them is behind the counter. Photograph of the Hastings Grove store taken in 1985. Caption on original matte read: "Hastings Grove store building, built in 1913, at 7276 Curtis Street. Dora Lochead, owner, had S.F. Munson contruct a two storey building to contain a public hall, boarding rooms and a store. By 1914 a post office was also in the building - known as Lochdale. It is used as a multi-family dwelling today.". 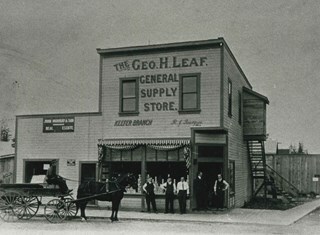 Photograph of the second George Leaf General Store, located on Keefer Road (now McKay Avenue). Bob Burgess (half-brother to George Leaf) was the manager of the store. George Leaf's first general store, located at 12th Avenue and 6th Street, 7745 6th Street, burned down in 1913. 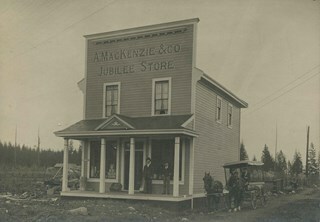 Photograph of A. MacKenzie & Co. Jubilee Store. There are two men in suits standing out in front of the store, infront of display windows that are lined with stacks of boxes and cans. The lot around the building looks vacant, but fenced. There is a wagon drawn by a team of two horses parked or travelling towards the store on the right. The store was owned by Alexander MacKenzie, (1870-1949) who arrived in Vancouver in 1907. This store later became the Matheson and Sons Market. Notes on the bottom front of the card mount read: "Ralph Libby" and "Vancouver B.C." Photograph of the exterior of a store on the ground floor of a two-storey building, with a sign painted on the front face of the second floor. It reads, "A. MacKenzie & Co / Jubilee Store." There are two men in suits standing out in front of the display windows that show stacks of boxes and cans. The lot around the building looks vacant, but fenced. There is a wagon drawn by a team of two horses parked or travelling towards the store on the right side of the photograph. The store was owned by Alexander MacKenzie, (1870-1949) who arrived in Vancouver in 1907. There is a discrepancy in the date of the photograph; the accession register dates the photograph 1909 while the donation form signed by the donor dates all the photographs in the accession as 1907 or 1908. Annotations on the bottom front of the card mount read: "Ralph Libby" and "Vancouver B.C." This store later became the Matheson and Sons Market. Photograph of a store with a large Coca Cola sign hanging by the second floor windows. The awning has lettering: "Ice Cream - Soft Drinks." By the door, there is a sign that reads "Post Office / Public Telephone / Box Cigars." On the display window, an advertisement sign for "Salada Tea" can be seen. By the steps leading into the store, there is a large advertisement sign that reads "Wilson's Bachelor Cigar 10c." In front of the store is a paved road. An annotation on the back of the photograph reads, "Dow General Store / Sperling & Hastings Approx / 1930's." The 1937 directory lists the name as "Dow's General Store" and the address as 6669 Hastings Street. 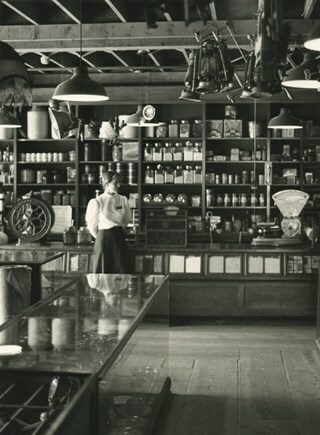 Photograph of the interior of the general store building at the official opening of Heritage Village (now Burnaby Village Museum), November 19, 1971. Visitors can be seen perusing the merchandise displayed in the exhibit. Material relating to the opening of BVM. Richard Lott and Deirdre Lott were the first Director and Curator respectively working for the contractor building the museum. 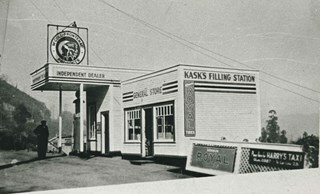 Photograph of Kask's Filling Station, Kask's Camp, Barnet Road. It was located next to Kask's General Store to serve residents of the 30 to 35 rental cabins, plus the Kask home. The Kasks also operated a steam bath. Track 2: This portion of the recording pertains to responsibilities, chores, and money. Cice recalls her chores, and how she spent her allowance. She describes her jobs in Mr. Pitman’s drygoods stores, on Kingsway and on Jubilee Ave., and in Anne Reid’s candy shop. Asked about church, Cice discusses her involvement with the Henderson-Jubilee United church, and C.G.I.T..
Recording of an interview with Cice Brown, interviewed by Tom Gooden on May 10 2005. This recording was completed for an exhibit, Growing Up in Burnaby, for the Burnaby Village Museum. Major themes discussed are growing up in Burnaby in the 1930s and 40s.